Looking for a good deal on a router and dovetail jig to go along with it? 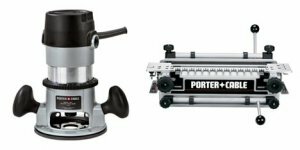 For a limited time Rockler is offering a Porter-Cable 690LR fixed base router and a 4210 dovetail jig for the low price of only $199.98. This is a savings of about $50 if you were to purchase each one separately from Amazon. The 690LR features a 1-3/4 horsepower motor that spins at 27,500 RPM's and comes including collets for both 1/4-inch and 1/2-inch shank bits. The 4210 dovetail jig has a 12-inch board width capacity and can be used to cut half-blind, rabbeted half-blind, and sliding dovetails. The jig can accept stock from 1/4-inch to 1-1/8-inch think. Included with the jig is a 1/2-inch shank carbide-tipped dovetail bit.